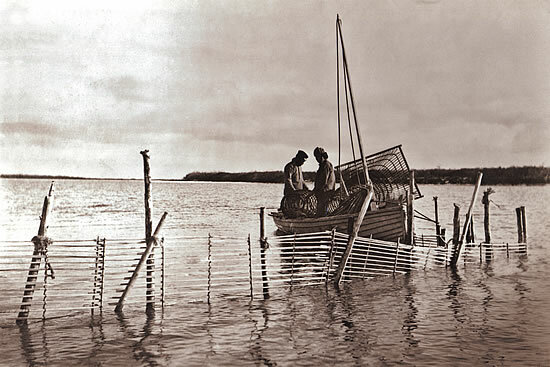 Men set a wooden fish trap and fence in the 1930s. Nick Andrew recalled: "They looked after places where they got fish with utmost care. They did not want anything to happen to them." Tua-i tua-ll' uksungan, cikungan, cali taluyarpirluteng, taluyarpirluteng kuigpiim ceniinun. Tamaani manignarcurlartut. Iliini murilkaqamku nengllituami tamaani, waten can'utatullruuq cikuq. Katurarulluki-w' pilaamegteki, neruteklaamegteki. Tua-i taugken taqngata, taluyat civcameng akakiignek cangliqluteng. When winter came and it froze, they'd set their large fish traps along the sides of the Yukon River. They'd fish for burbot. Since it was cold in those days, sometimes the ice would be thick. They'd get together and set them, since everyone ate the fish they caught. And when they were done and the trap was in the water, it would catch many broad nosed whitefish.